Uneven application from traditional anhydrous ammonia systems can rob the crop of yield from the start. The 360 EQUI-FLOW with Liquimatic technology will take a new approach to NH3 delivery, for better row-to-row accuracy, improved sealing, and a wider application window. The 360 EQUI-FLOW keeps NH3 in a liquid state all the way down the knife, which ensures equal distribution from row to row. Testing conducted internally by the 360 Yield Center team revealed that cold flow systems have as much as 45 pounds of variance from knife to knife, with some rows as much as 22 over target and some as much as 22 under. The 360 EQUI-FLOW showed only eight pounds of variance, ranging from four pounds over target to four pounds under. 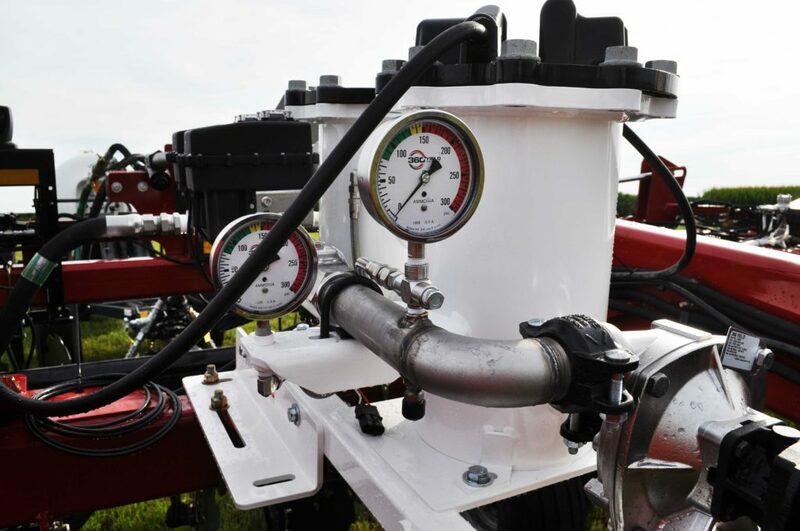 The 360 EQUI-FLOW uses a pressurized delivery system to keep anhydrous ammonia in the liquid form all the way to the knife, thus maintaining accuracy. Flow meters are accurate with liquid, but inaccurate with a mix of vapor and liquid. Rather than the 45 pounds of variation seen in tank-pressure systems, the 360 EQUI-FLOW reduced variability to around eight. Step 1: Ammonia from the tank is delivered to the initial filter. Step 2: In the Liquimatic tower, the ammonia is separated into gas and liquid with the vapor being condensed back down into liquid and all moving to the pump. Step 3: The hydraulically-driven centrifugal pump pushes 100 percent liquid ammonia through the flow meter and control valve to the manifold. Step 4: The equal distribution manifold equalizes flow to each outlet. Step 5: Every row gets the same amount of ammonia in liquid state.